Great News! The Mini version of the Performance Combo is available now. Incredibly easy to use and at a fraction of the original Performance Combo cost, the Mini will give you the sound you need to impress in your dance studio. 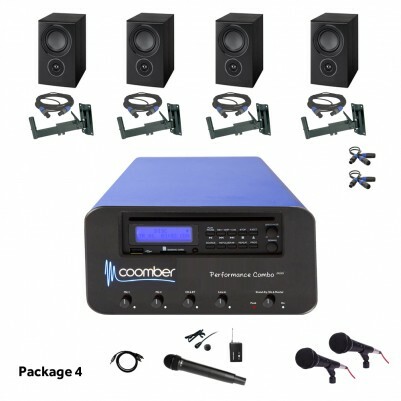 This sound system for dance includes everything you need: from the Performance Combo Mini amplifier to a complete package comprised of speakers, speaker wall brackets, microphones, power lead and iPad lead. Everything you need to make your dance studio the perfect place for learning and performing dance routines! Your dance studio sound system is such an essential part of your dance class. In the most important moments you need to rely on good speakers, good microphones and audio controls that behave in predictable ways. Whether you teach line dance, twist or ballet, the Performance Combo Mini will give you both the power and the sound quality to impress and motivate your dance students. Do you have nightmarish recollections of tangled wires and controls, buttons or switches that have a mind of their own? An unpredictable sound system is the last thing you want to worry about. The Performance Combo Mini will give you a totally different experience. With just 4 volume controls, one for each input (Mic 1, Mic 2, CD/USB/SD/Bluetooth, Line in) and a master volume, working with the Mini music system is child’s play. A sound system you can trust is a priceless possession for your dance studio. Think of the hours you will save not worrying about the sound and focusing instead on the dancers. It has been our goal as a company to provide dance teachers with quality audio products that are easy to use and reliable at the same time. Our hall sound systems are made in our factory in Worcester, UK and we are always one phone call away for all your questions. *To select the wireless version choose "2 Wireless receivers" from the option "Built-in receivers for radio mics"
Not ready to place your order yet? That's okay. We are happy to discuss your studio's individual needs and give you a personalised quote. Feel free to give us a call on 01905 342 070 or click here to send us your enquiry.